I'm usually pretty out of touch when it comes to free activities in which I could involve my kids, but my friend Jenny turned me on to this one. 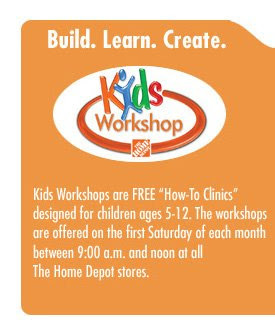 The Home Depot offers these fun Kids Workshops once a month at their stores. 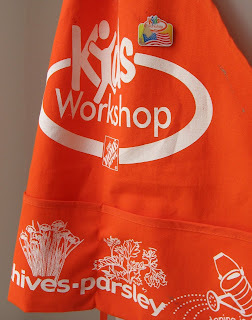 You take your child and they're given a free, personalized work apron (child-sized in the signature orange) and a project kit. I can't say exactly how it goes down because my husband took my daughter last weekend, but I know an employee instructs the parent-child teams on how to complete the day's project and when they're finished, the children are given achievement pins to stick on their aprons-much like scout badges, with an image for each specific completed project. According to the store website, they sometimes make useful or educational pieces like mail organizers and bug or bird houses. We went on flag holder day. Oh well. Still fun for the kids. And as the website promised, it allowed for quality one-on-one time between my husband and my daughter, which was our goal that morning. 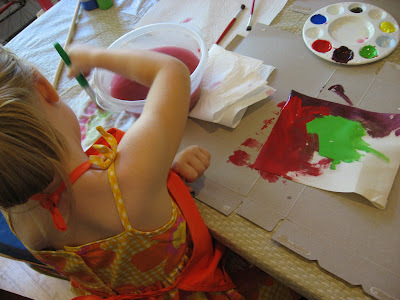 As you can see from the photos, the kit comes in bare wood, you assemble it at the store, and then can paint it at home. 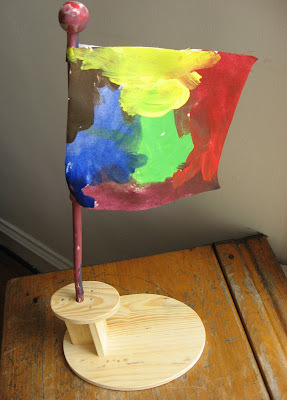 My daughter painted the flag and pole this morning. While wearing her new work apron, of course. She's excited about painting the base, as well, and I'm looking forward to watching their solution for how to use it during play. The Blick art store on Maple in Evanston has kids things on some Saturday afternoons, too. Or at least they did recently. Not sure how regular it is. Sounds right up your alley! You just can't beat an activity where you get a free orange apron! how cool! Thanks for passing this on! Thanks for that reminder. My oldest son will be turning 5 later this month so he will be able to go! We've done some wood building stuff at home and my then 2 year old even helped.